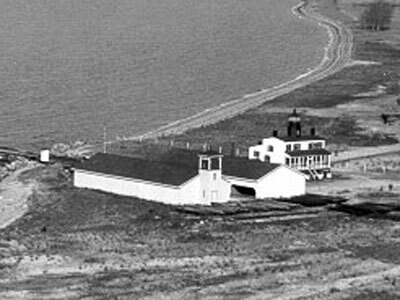 Point Lookout Lighthouse is a wooden dwelling with lantern on top. The light marks the entrance to the Potomac River at the southernmost tip of Maryland’s western shore. The lighthouse is owned by Maryland and is accessible periodically by volunteers of the Point Lookout Lighthouse Preservation Society. Prior to construction of the light station, Point Lookout was the location of a military hospital and a Union prisoner of war camp, notorious for its squalid conditions that led to the death of many Confederate prisoners.